Amsterdam has more than a few world class hotels. The best luxury hotels are listed below. These are all 5 star deluxe hotels with a reputation for excellence. The location of these hotels are without exception unique and often the interior is also up to par with the best in luxury hotels. 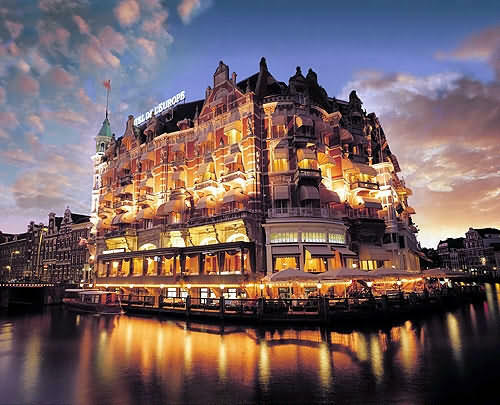 Hotel De L’Europe is located at the head of the Amstel river right between Dam Square and Rembrandtplein. This is true luxury in a Dutch fashion. You will be surrounded by original Dutch masters, partly from the private collection of Freddy Heineken (yes that Heineken). Some people call this the most expensive hotel in Amsterdam, and it has the decor and services to back it up. Click here for more info or booking Hotel De L’Europe. 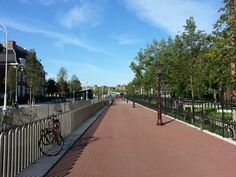 Dining and bars: Michelin star awarded Bord D’eau, Freddy’s Cocktail Bar (Best in Netherlands in 2012), Hoofdstad Brasserie, Het Terras (the terrace on the Amstel) and De Promenade. 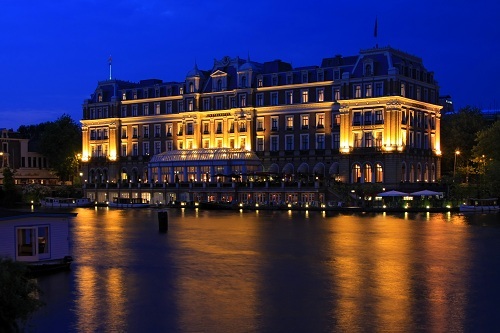 Amstel Hotel is one of the crown jewels in the luxury hotels from the Intercontinental chain. This might just be the most prestigious hotel in Amsterdam. Founded in 1867 the Amstel Hotel is one of the few hotels in the world where every corner of every room has a story. Many foreign dignitaries, royalty and heads of state have experienced the grandeur. 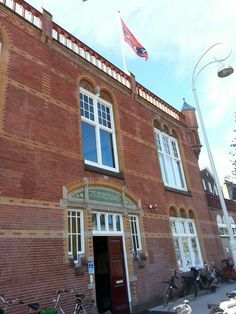 It is located on the Amstel river nearby Rembrandtplein and the Royal Theatre Carre. Click here for more info or booking Amstel Hotel. Dining and bars: Michelin star awarded La Rive, Amstel Bar & Brasserie, Amstel Lounge & Terraces, the A Bar. 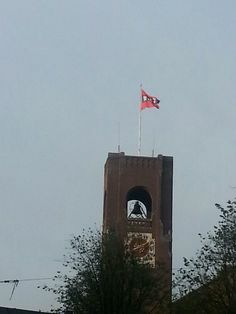 The Grand is unique in its location close to the Red Light District. 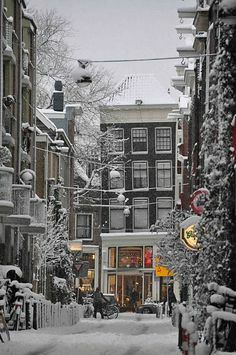 It is right in the middle of the oldest part of Amsterdam. 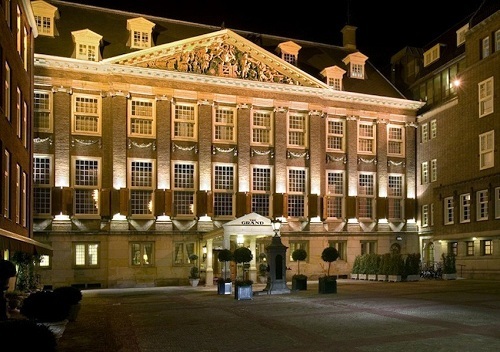 This perhaps most classic of all Amsterdam luxury hotels is part of the Sofitel chain. It has a fantastic historical building with all modern services you require. Many royals, pop stars and movie stars have stayed in this hotel since 1578. The Grand has a beautiful garden, probably the biggest in this area. Click here for more info or booking The Grand Amsterdam. 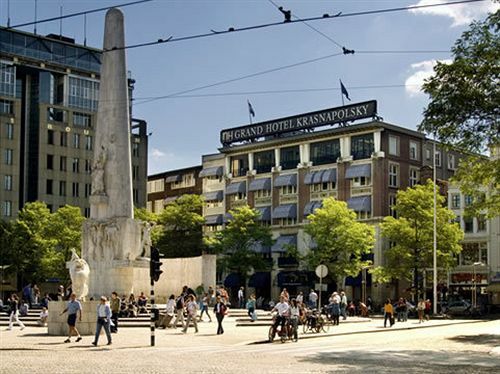 The only of all luxury hotels in Amsterdam located right on Dam Square. The building of the hotel dates from 1866 and is equipped with all modern features a 5 star hotel should have. Famous for its prestigious Wintertuin (Wintergarden) which is a unique inner garden where lunch is being served. Obviously the location is also unrivalled. Krasnapolsky is right in the middle of things, but has the quiet grandeur a luxury hotel should have. Click here for more info or booking NH Grand Hotel Krasnapolsky. Hotel Pulitzer is a unique luxury hotel in the world, because its based in a row of authentic canal houses. Located on both the Prinsengracht and the Keizersgracht, the location is ideal for people who want to experience Amsterdam’s rich culture. 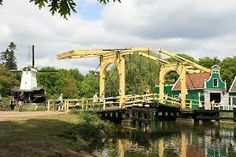 Even though the canal houses have been altered in the past, the gables are still more than 500 years old. One of the rooms of the restaurant is one of only two original 17th century shop interiors in Amsterdam. Experience original ancient Amsterdam atmosphere in one of the 25 canal houses in which the hotel is situated. One of the especially great things of this hotel is the large center courtyard with terraces and gardens. 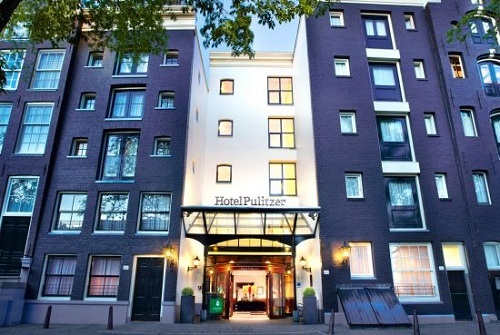 Click here for more info about Hotel Pulitzer. The Dylan Amsterdam is a 5 star boutique hotel located on the Keizersgracht in a series of canal houses. The entry is a 17th century facade which adds an exclusive feel to this luxury hotel. Typical for a canal house location is the beautiful courtyard. 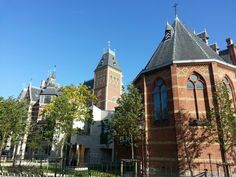 You’ll be staying in a true blue historical Amsterdam monument. The building used to be a theatre where people like Vivaldi performed and people like the King of Poland, the Prince of Orange and the Russian Tsar attended. Indulge in the Michelin starred Restaurant Vinkeles with its excellent contemporary French cuisine. The restaurant is located in the Dylan hotel, in an old bakery. Or, you can enjoy their cooking on a hotel sponsored boat ride. Click here for more info about The Dylan Amsterdam.